This past weekend my husband was out of town and I was flipping through the previously completed French Fridays with Dorie recipes, looking for something quick and easy to throw together for my Friday night dinner. I had plans to go out with friends on Saturday but I kept Friday night all to myself because, as much as I enjoy going out with my girlfriends, I also enjoy the occasional night when I can indulge in total laziness and exercise complete control over the remote. As I was flipping through the completed recipes I noticed one which received what can only be described as consistently surprised rave reviews. That is to say, nobody thought they were going to like this one, but they all ended up loving it. And not just because it was tasty, but also crazy easy, which sounded like a perfect recipe for my lazy Friday night to myself. Beggar’s Linguine is not an easy recipe to sell and it is no wonder that most of the FFwD crew were not expecting to like this one. 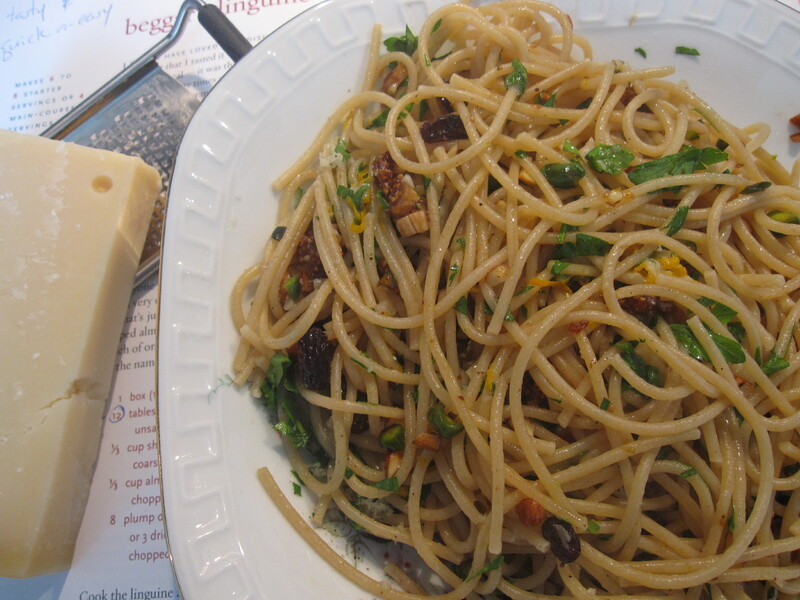 It is pasta topped with brown butter, chopped nuts, and (here’s the questionable part) dried figs & raisins. Whaaat? Sounds weird right? But I decided to trust all those rave reviews and give it a go, swapping out the linguine for whole wheat spaghetti (just because that’s what I always have in my cupboard). And I am so happy that I did because they were so right, it is delicious! As unlikely as it all sounds, the flavors just blend together beautifully and create a really tasty combination which I can only describe as instant comfort food. The moral of the story is that I should trust the FFwD crew. I will definitely be making this one again… maybe even for my husband. This entry was posted in french fridays with dorie and tagged Around my French Table, pasta, vegetarian. Bookmark the permalink. Oh baby, I loved this one! Now I’m hungry for it. I thought the orange zest tied it all together so beautifully. mmm. I applaud you for cooking through the past FFwD recipes! Around My French Table was the book that inspired me to create my blog, but I didn’t start FFwD until after I was mostly finished with my month with the book, so there’s a ton of stuff that they made that I haven’t (mmmm…eclaaaaairs). Good job! This was an interesting dish for me when I made it. But, I’m glad I tried it!